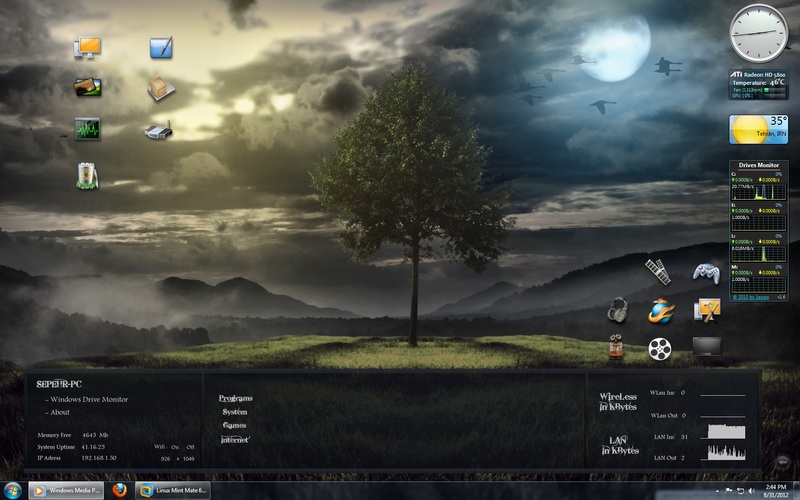 Created to be beautiful and functional at the same time , by keeping the windows sidebar and taskbar . with one or two clicks . The bottom bar looks the same as in Fantasy and shows a lot of empty space in the middle. About use with the sidebar: With the Vista sidebar, it will protrude into the sidebar area. With the Win7 sidebar, it takes up space that can be used by gadgets. Unknown how it will interfere with Tiles as I don't use them. Suggestion: If you make the bar 1024 in width, maximum, your theme will be more or less resolution independant, as most screens are at least that wide. On most screens, that will allow more room for the sidebar or tiles. Text shortcuts are so XP. I think you have talent. You should ditch the text shortcuts for drag and drop. Just my opinion.